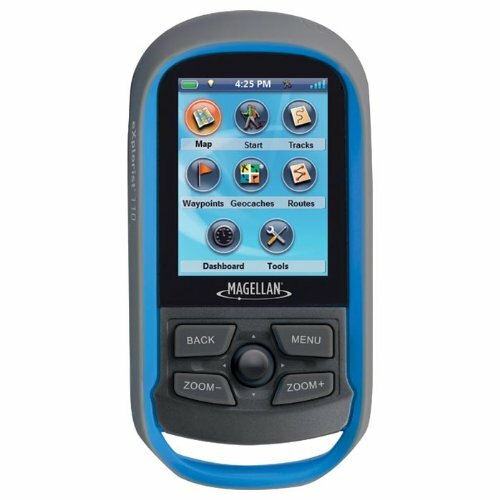 The Magellan eXplorist 110 GPS receiver is ready to use right out of the box with a color screen, rich graphics, and a simple user interface all packed into a rugged and waterproof device. The GPS receiver is powered by two AA batteries for up to 18 hours of outdoor adventure. A highly-sensitive SiRFstarIII GPS chipset provides 3-5 meter accuracy. With its simple interface, the eXplorist 110 is great for basic navigation. The product comes with essential outdoor GPS features, such as waypoint creation, pre-loaded World Edition map, active tracking and track summary. Wt: 5.12 oz.